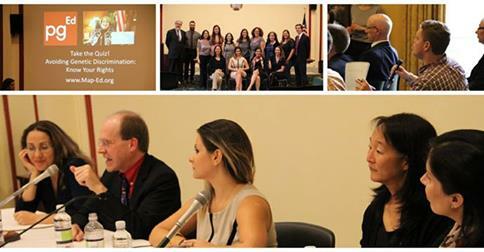 This briefing was the second in a series that pgEd was invited to organize on personal genetics, as a safe and fair integration of genetics into society will require an informed public, in which all individuals are aware of the benefits and implications of personal genetics. The briefing began with an update on recent advances in genetic technologies and then featured the latest research from the front lines of the Ebola outbreak, highlighting how scientists are using sequencing as a tool towards curbing this epidemic. It then focused on the Genetic Information Nondiscrimination Act (GINA), wherein a panel of experts looked ahead to new challenges arising from developments in technology, medicine, genetics, neuroscience, and beyond, highlighting the opportunities and implications for civil rights brought about by the era of personal genetics and the memory of the country’s earlier experience with eugenics. Click here for press release from the Office of Congresswoman Louise Slaughter and here for full briefing program.